You'll be £48.00 closer to your next £10.00 credit when you purchase British Warship Recognition: The Perkins Identification Albums, Volume II. What's this? Following the Museum’s binding arrangement, this second volume of the series covers armoured ships from Warrior to the Royal Sovereigns (all later capital ships from the Majestic class onwards can be found in Volume I), as well as monitors and seaplane and aircraft carriers. An incredible continuation to a publisized version of The Perkins Identification Albums. An amazing collection of accurately recorded etchings of ship of the British Royal Navy! An underutilized gem long trapped in the repositories of the National Maritime Museum, the publication of this volume and other will be of great importance to those with an interest in the Royal Navy during the eight decades prior to the Second World War. Whether one is interested in the subject or not, and this reviewer must admit that he is not particularly, the effort, detail and love that has gone into the production of the pictures in this book trumps all. A well produced and substantial collection which is an invaluable reference work. This book, which is the second in a probable series of eight volumes, is excellent value for money. I have only one complaint, I will need to invest in new shelves to hold these remarkable volumes! Highly recommended. As featured on Army Rumour Service! The coloured profiles of all these ships, some famous and other not so famous, are delightful to see in their own right, with the obvious care and attention to detail that a real enthusiast has devoted to them over many years. What they make is pretty much a recognition bible for anyone wanting to identify individual ships in old photographs, and the whole collection would therefore be a museum photo curator's dream reference. In saying that it would be very easy or them to remain just that, a valuable resource hidden away in a museum collection and accessible to only a few. By the National Maritime Museum and Seaforth working together to produce these excellent quality copies, anyone can have access to this marvelous resource. Not only is it an invaluable photo interpretation reference, but the volume and detail all carefully noted and coloured by hand over many years of an individual's obvious passion is simply delightful to see in its' own right. With this first one looking at Capital Ships, the remaining 7 volumes are certainly to be looked forward to, and there are notes in the book of just what is included in each of the other albums to come. Here we have the second volume of the quite extraordinary warship recognition albums made by a remarkable man named Richard Perkins before the Second World War. He held a vast collection of warship photographs and produced beautiful drawings of the ships that interested him so he could plot the differences in classes and following refits to aid in the identification of particular vessels. There is no question a book like this is pretty niche. The format is huge, and the price tag reflects the quality of the reproduction of Mr Perkins wonderful drawings. Happily, his archive is safe in the hands of the National Maritime Museum at Greenwich, and we are likely to see more in this series. Mr Perkins’ books are just the sort of thing that would have been torn up to make individually framed prints in less enlightened times so fans of his work are all winners here. I would also like to see his photograph collection presented in book form. Perhaps that is on the agenda. Until then more of his beautiful drawings and efficient notes will be most welcome. Gorgeous stuff. As with its companion volume on Royal Navy Battleships and Battlecruisers, this work is worthy of such superlatives as ‘Remarkable’ and ‘Impressive’. This reviewer had previously viewed Volume 1 of this series, and was very impressed with that work. Volume 2 is in a similar vein. It is a highly-detailed record of the changes made to specific vessels of the Royal Navy in the course of their service careers. That a single individual was dedicated-enough to undertake such a task is, at the very least, remarkable. Even more remarkable is the fact that this volume (as with its companions in the series) was originally created as one man’s reference work for his personal use. Intended to act as an aide memoir to his collection of naval photographs, it was never intended for public viewing. That it survived much relocation over the years before being donated to the National Maritime Museum is something for which those interested in naval history in general and the Royal Navy in particular, should be thankful. As noted in Volume 1 of this series, the author decided to ‘…Document faithfully the appearance and alterations made to…many hundreds of British warships…’ Accomplishing this required the taking of numerous images of Royal Navy vessels, which in turn led to the creation of a photographic collection of considerable size. Recognition Manuals were created to detail the alterations that each ship underwent. The scale and accuracy of the drawings within these led to the author being eventually recognised as an authority on the ships of the Royal Navy, the illustrations being both a national treasure and a research tool of immense value. The majority of ships illustrated within this work comprise those vessels in service in the Royal Navy between 1860, and 1895. Within this broad classification, various subheadings appear. Amongst others, these cover such specialist vessels as Old Battleships, Broadside Ships and Floating Batteries. The vessels within such headings are then investigated in detail with each and every modification they carried during their naval career being clearly and carefully detailed. It is at this point that this work’s value becomes apparent and its creator’s dedication to his craft very evident. 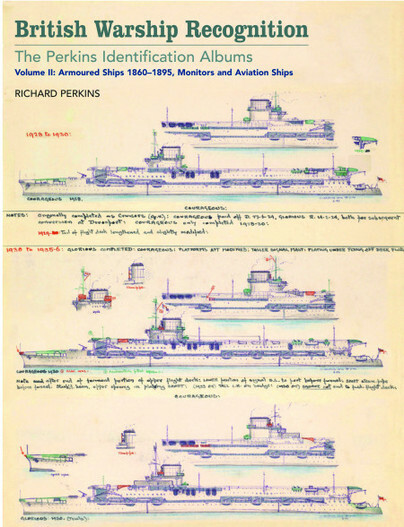 A pen and ink image depicts each vessel in profile, with water-colour paints being used to give depth and shade. Clear and legible hand-written details of the vessel’s naval career appear below each image. Although most vessels are represented by a single profile, others are portrayed through the use of yearly blocks of varying length. Doing this required the creation of more hand-drawn images – all to the same high standard. Smaller ‘scrap-type’ illustrations notate any differences between individual vessels within a class and any modifications undergone by the specific vessel. These can typically include alterations made to armament, masts, funnels and searchlights. The modifications are colour-coded. The effect is astonishing, and it is possible to follow the progress and ‘evolution’ of a ship from its service entry, through its various refits to its final withdrawal. An added bonus is the presence of images of several vessels in their ‘retirement’ phase of being hulks, a feature not usually found in recognition works such as these. Not content with merely investigating the older classes of battleships and their ilk, the author also presents images and modifications for other vessels. The most notable of these are the so-called ‘Aviation ships’ a category which includes Balloon and Seaplane carriers and those Royal Navy Aircraft Carriers in service in 1938. The volume contains a Contents section, a Publisher\s Note, an Acknowledgments section and a List of Abbreviations. An Index and three of the author’s photographs also appear, as does an Introduction by the Curator of Historic Photographs and Ships’ Plans at the National Maritime Museum. A section titled Authors Note’s is included as well, these being largely-handwritten references concerning various vessels within the larger volume. The volume focuses largely on the 1860-1895 period. As a result, those seeking details of vessels that saw active service in WWI and WWII may be disappointed. Students of British Naval Aviation however, may find the Aviation Ships section of interest, as it concerns British naval aviation for the 1914-1938 period. In addition, and despite its emphasis on vessels of the 1860-1895 period, this reviewer believes that the volume should still appeal to a wide variety of readers; ship-modellers, those with interests in or connections to the Royal Navy and to students of naval warfare. For such readers this volume could prove to be a valued and much-used resource.